Last weekend, I decided I needed to head out to take pictures. It was perfect conditions - it was nice and cool outside, and there were some nice clouds in the sky. If my timing was good, there might just be a neat sunset out there. So I decided to head to downtown Little Rock and visit another parking deck. This one provides a decent view looking off towards the west, which would hopefully provide some nice views of the sunset. And indeed, it did turn out to be a nice sunset. But I wasn't in the best spot to get a good view of it. This is the view I had, looking towards the Metropolitan National Bank Building and the spire of the Cathedral of St. Andrew. And then I waited for dusk to settle in over the city. 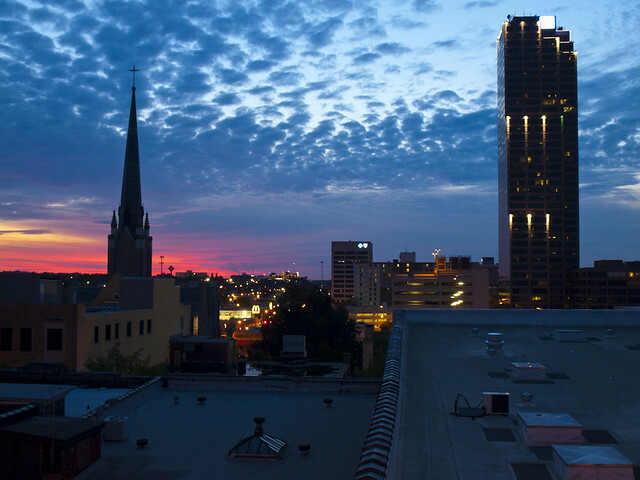 The view from this parking deck overlooked the top of a row of buildings (which front Main Street), with a scattering of some of Little Rock's taller buildings. While this isn't the best place around to see the modest Little Rock skyline (that would be the Junction Bridge or Fort Roots), it would make for a perfect shooting location for an action movie. It would be great for a scene where the hero cops (one who plays by his own rules and always getting in trouble with the commissioner, and his partner who is just weeks short of retirement) are chasing a bad guy through downtown. The scene would start with a car chase - where the bad guy's car would improbably smash through a randomly placed fruit cart vendor, and then through a large piece of glass that two guys are trying to carry across the street. Somehow the bad guy would escape and make his way up to the rooftop, where the hero cops would give chase. 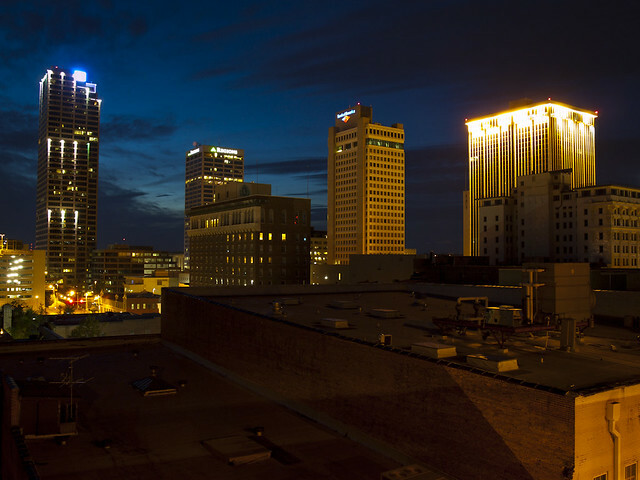 The bad guy would run across the rooftop, seen above, with the downtown skyline in the background. But then, he would jump across a narrow alley, rolling to a stop just as the two cops come to the edge of the roof. The two cops would see that the jump is too much for them and hesitate. Then the older cop would say that he is just too old for this sh#t. Last week I was in deep discussions with Zack about a possible photo expedition over the weekend. 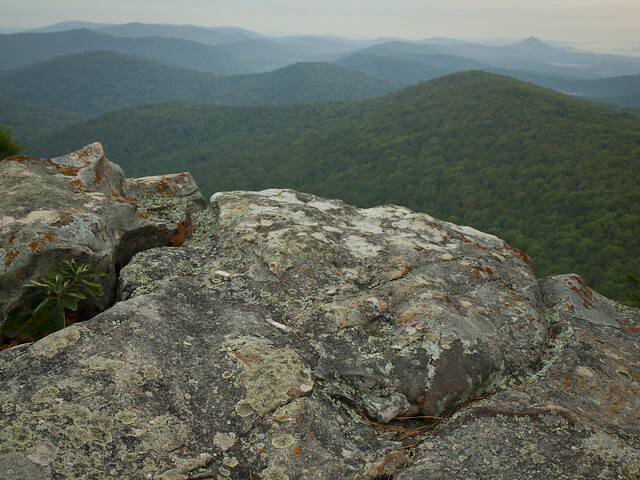 Eventually, we decided to visit Flatside Pinnacle, which sits in the Flatside Wilderness of the Ouachita National Forest. Once that was settled, the debate then turned to what time to head out. I, naturally, opted to depart in mid-morning - the better to sleep in some. But Zack, for some bizarre reason, wanted to leave early enough to catch the sunrise from Flatside. He thought that there might be some nice fog that morning. So I reluctantly agreed to be awake before sunrise on Saturday morning. My alarm clock went off at 4:45 am, and it took me a few confused minutes to remember why I was supposed to be awake before noon. But I slowly got around and grabbed the camera and headed out the door. Flatside is a great place to take pictures. 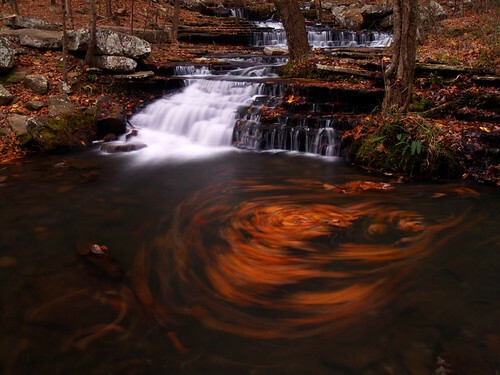 It's conveniently located to both of us - only about an hour's drive from Little Rock. And it's amazingly scenic. 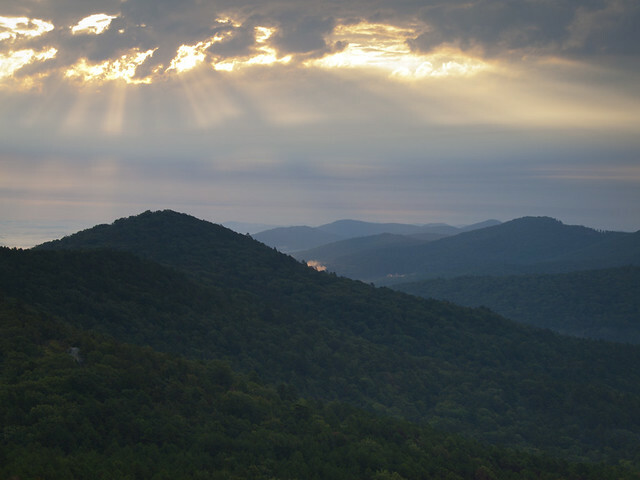 The view from Flatside Pinnacle is of countless rolling hills, all covered in trees. So I met Zack and we set off into the wilderness in the dark. To reach Flatside, you drive down part of the Winona Scenic Drive. This is all a dirt road, but it's in fairly good condition with just a few bumpy spots. I was driving, so I cringed every time a rock would shoot up and bounce around the undercarriage of the car like it was in a pinball machine. I imagined the rock hitting the fuel tank, the engine, the transmission, the flux capacitor, or whatever else was vulnerable in the car. But we made it there safe and sound, just before sunrise. The trail at Flatside has recently been fixed up, and re-routed so it gradually works its way up the mountain. But the steepest part of the hike remains, and it quickly reminded me that I haven't done much of any hiking in several months. The new trail wasn't the only change at Flatside. There was a fire there, which burned off a lot of the undergrowth along the trail. Even on the top of Flatside, there were places that had been scorched. We weren't sure then if the fire was from a lightning strike or from a Forest Service controlled burn. But we got to the top of Flatside just in time for sunrise. My pictures didn't really turn out, so when the sun disappeared behind some clouds, I went and took some pictures of the view. 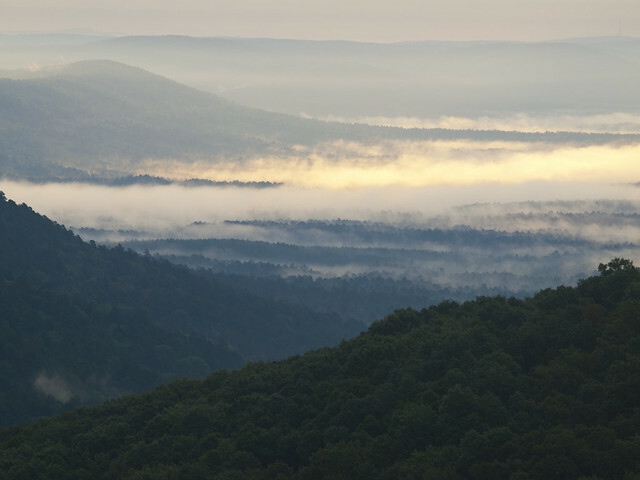 And it's a great view - this is looking west across the Ouachitas. From there we decided to go and explore a nearby bluff, which we thought might provide another good view. This area had also recently burned. The ground was still a blanket of black ash, and it was littered with the charred husks of burned trees. 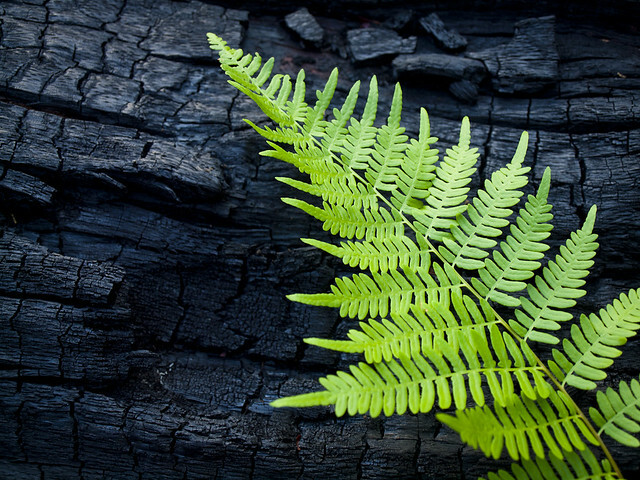 But amongst the scorched ruins was new life - mostly in the forms of bright green ferns. We pushed our way through the burned area, and I managed to get a good deal of soot and ash on me. But it was worth the hike (and dirty clothes). The view was awesome. And it would be a great spot to catch the sunrise again. 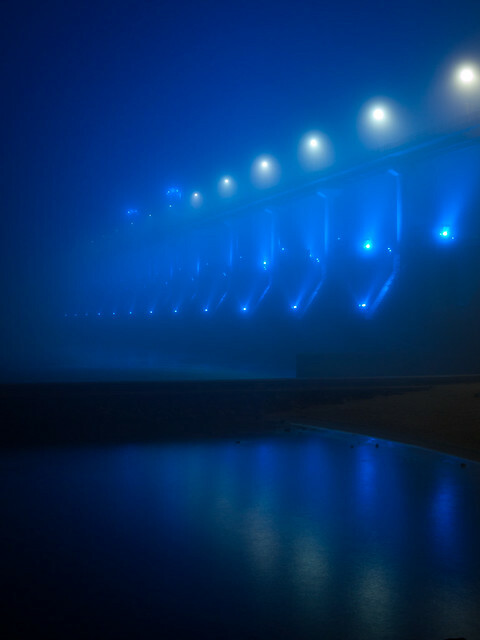 There wasn't as much fog as we had hoped for, but there was still enough to add some character to the scene. 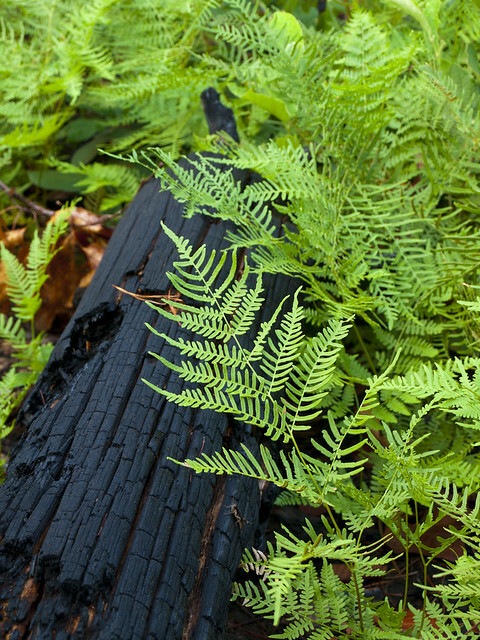 We did stop to get a few shots of the bright green ferns that were growing up in the blackened and seared landscape. From there we got back to the car and continued on the Winona Scenic Drive. We passed a few signs saying that there were going to be prescribed burns in the area, so that must have been what happened at Flatside. We made a few other stops, but I don't think either of us got any good pictures. We drove around aimlessly while trying to find a good view of Forked Mountain, then explored a few places along Hwy. 7 south of Russellville. After getting lunch in Russellville, it was time to head home. After having woken up at 4:45, I was looking forward to a nice nap. I'm very pleased and humbled to report that one of my pictures was chosen to tour the state next year as part of the 2012 Small Works on Paper exhibition. SWOP is part of the Arkansas Arts Council, and it will visit ten cities across the state. The opening will be at Laman Library in North Little Rock. 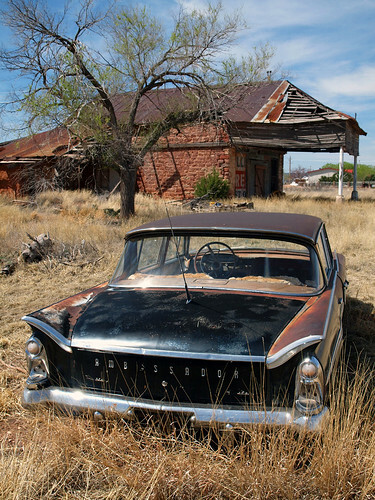 Taken along Route 66 in Newkirk, New Mexico. 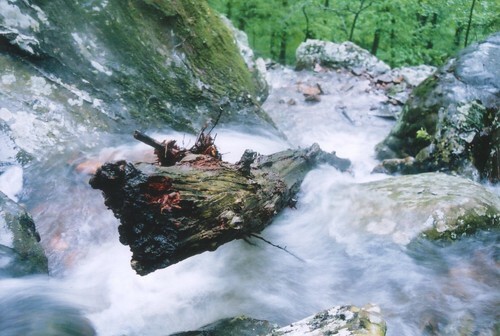 Also taken at Collins Creek. 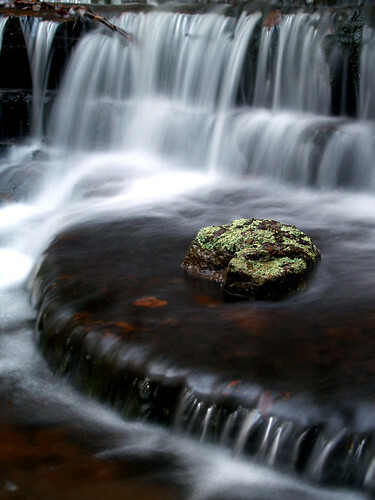 Taken at Petit Jean State Park.